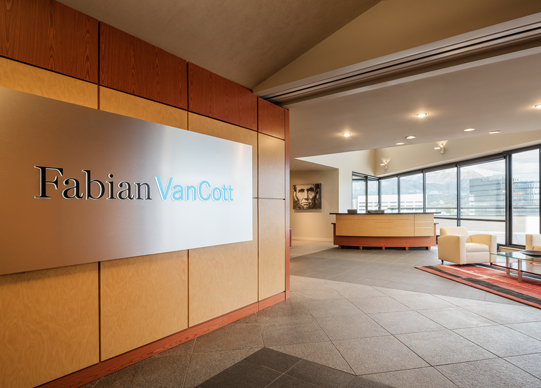 Fabian VanCott’s attorneys provide the highest level of legal services to meet the diverse needs of the firm’s clients. We have a talented, experienced team of litigators and trial attorneys who routinely practice throughout the United States in federal and state courts, in arbitrations and mediations, and before administrative agencies and governmental bodies. And our attorneys routinely win. We also have a broad transactional practice for our many business and corporate clients. We work hand-in-hand with these clients to fully understand their businesses and competitive environments. This understanding enables us to more meaningfully and effectively advise our clients during a variety of transactions and when negotiating, structuring and closing numerous types of agreements and deals. In all that we do, we are committed to prompt and cost-effective solutions. Our offices are located in Salt Lake City, Utah and Las Vegas, Nevada.